Seatruck Ferries has increased capacity and frequency between Dublin and Liverpool by replacing its smallest vessel on the route, the Clipper Ranger, with a larger P series vessel offering almost twice the capacity. It has also added additional Friday sailings, bringing its frequency on the route to 44 per week, or 78 per week across all three of its Irish Sea services. 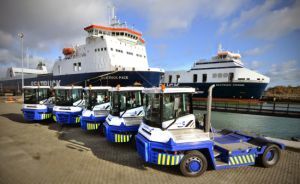 Seatruck, which currently moves around 20% of total Irish Sea ro ro freight volumes, says that truck driver shortages are causing many operators to reassess their traditional accompanied method. Capacity on Seatruck’s Warrenpoint to Heysham. route has just been increased by 30% with the introduction of the Seatruck Performance and Seatruck Precision. Chief executive Alistair Eagles, said: “The recent vessel changes in Warrenpoint have allowed us to cascade additional modern tonnage onto our fast-growing Dublin – Liverpool route. The P series vessel is larger, faster and will improve schedule reliability in inclement weather.